Who’s coming up on Monday February 27? It’s hard to miss EKK! Each week before I send out my weekly “wrap” I try to run it by Jodi Ascuena so she can catch any errors in my Hawaiian diacritical marks and song titles. So I took my draft to the studio and read this to her. When I finished, her face turned as orange as her henna-colored hair, she took off her glasses, and a flood of real tears poured down her cheeks, and she wailed, “I am so torn! I can’t believe that I am going to miss the rest of the EKK season!” She finally booked her repeatedly postponed trip to Aotearoa, mainly because each year she could not think of missing EKK. She hasn’t even left the island and already she’s missing her home, especially EKK. Ooops! EKK Week #5 – Malie Gets Everybody into the Act! 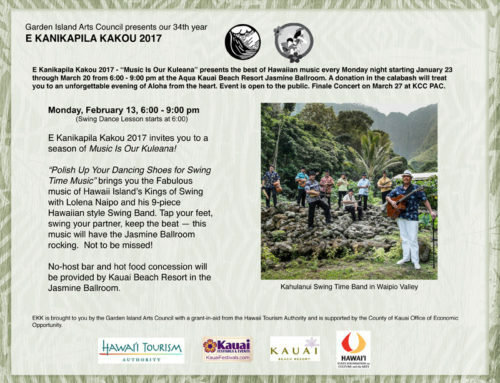 I was writing about the Kahulanui evening on Monday morning, February 20, and wondering if the hula program coming up that night was going to be as exciting as the previous week. What a question! Malie Foundation always TOP themselves and come up with something new every time. Not only was it exciting, it was entertainment from the heart; it was inclusive and brought out hula dancers from Kekaha to Haena and every town in between; it was authentic hula fun with great music from a ten-piece musical ensemble with a tiple player who lives across the “Last Stop Store” in Wainiha, David Helder, to a fantastic Hawaiian piano player from Kekaha, Kunane “Uncle Kunz” Aipolani, and everyone in between. 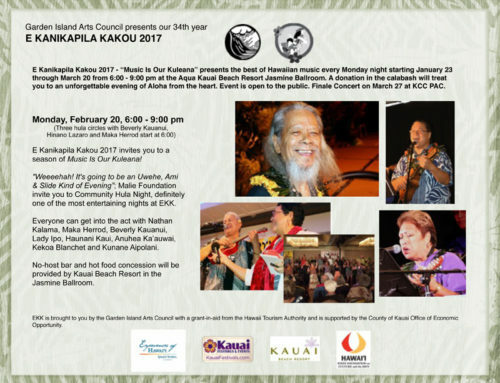 Beverly Kauanui was the leader of the group on ‘ukulele and vocals, Haunani Kaui and Pat Kauanui on guitar, Kekoa Blanchet on steel guitar, Anuhea Ka’auwai Herrod on upright bass, Uncle Nathan, Maka Herrod and Lady Ipo on ‘ukulele, vocals and emcee duties. What fantastic music! Of course, because it was community hula night, the emphasis was on showcasing the hula Kaua’i island style, so it was Hula! Hula! Hula! From beginning to end. From 6:00 to 6:45, there were three hula circles side-by-side with over a hundred dancers learning a new hula from Beverly Kauanui teaching Hanalei in the Moonlight, Maka Herrod teaching My Puakenikeni, and Troy Hinano Lazaro teaching Ipo Lei Momi. Lady Ipo and Maka Herrod shared the emcee duties and asked the audience to join in on the hymn Ho`onani Ka Makua Mau to open the program; with a full house, the singing was great. You look around at EKK and you see a sea of faces with big grins of joy and happiness; that is what you experience at EKK! Locals know that it’s always fun at community hula night so many turned out full force so the hotel staff kept bringing out stacks of chairs for the standing crowd. First on the program were the dancers in the three hula circles, all of which learned their hula in less than an hour. Leading off was Troy Hinano Lazaro who called up the 45 dancers in his circle; they performed a lively and sensuous hula called Ipo Lei Momi composed by Keali’i Reichel, a song about the beautiful “black pearl” … not the one that you wear as a jewelry. (my body temperature escalated when I read the lyrics!) It was a 45-minute miracle as they pulled off the fun and energetic hula like real pro dancers, definitely not for the faint-hearted. He reassured the dancers, “There is no right way, no wrong way; just have fun!” Hinano followed the group dance with a hula solo toI Ali’i No ‘Oe to honor his kumu. Auntie Beverly Kehaulani Kauanui, with the help of her hula hui members, taught a hula about all the romantic things that go on in Kawaikapu’okalani Hewett’s Hanalei in the Moonlight. Several of the thirty dancers had just had their first hula lesson but they looked and felt gorgeous; hula songs composed by Hewett has that effect on the dancers. Beverly asked her dancers to do the honors for her hana hou number Kamawaelualani to honor Doric and his wife Momi. The long awaited thing has finally happened: Hinano Lazaro is the “new kid on the kumu hula block”; he officially took on the mantle of kumu hula after many years of dancing with the late Kumu hula Doric Kaleonui Yaris. Word is that at his first meeting at the Koloa Neighborhood Center in December, he was inundated with prospective hula students hoping to learn under his guidance. From the first time I saw this young man dance at Uncle Nathan’s 50th birthday party, where I dubbed him “liquid silver” because that best describes how he danced, I had no doubt that one day he would be a kumu hula, and that day has come with the wonderful EKK audience enjoying his first public performance. And what a magnificent show of excellence they put on. Hinano’s chanting and solo hula numbers were all total chicken skin experiences. Auntie Beverly Kauanui who led the band also showed up with her proudly labeled “bleached-out Hawaiian” hula dancers. They are no strangers to performing because Beverly performs actively, not only in her north shore territory, but for backyard parties and events all over the island. Their swaying hips and graceful hands tell the hula stories as well as their brown-skinned sisters. Not only does she have a following of loyal dancers, she shows up with her dedicated band members. On top of that she has a northshore ‘ukulele group who performed at EKK a couple of years ago. Maka Herrod, the energetic and charismatic leader who pulled togethertonight’s community hula gathering, like his Uncle Nathan, is a human magnet who attracts the creative and fun-loving people who want to be part of the action because he’s the action man who manages to create a chain reaction of excitement wherever he goes. “Boom Shaka Laka Maka” is a dynamite leader who, together with Lady Ipo, are so much in demand as emcees who also perform. You look around and see the hands-on board members of the Malie Foundation who are ever present at all their functions. Maka and Nathan shared with the audience the development and close-knit symbiotic relationship between GIAC and Malie Foundation out of which the popular Kaua’i Mokihana Festival events were brought to fruition. Uncle Nathan, who for the past two years of EKK forfeited his lovingly nurtured beard to raise money for the Punana Leo scholarship fund and last year to help GIAC insure that we could start EKK 2017. So here we are! “I would be remiss if I did not do this,” he said and led the audience in singing “Happy 40-Year-Old Birthday to Garden Island Arts Council”! Tonight he decided to go Kumu hula “emeritus” and proudly showed off his kupuna Halau dancers – Nani Rogers, Winnie Smith, Barbara Say, Arlene Kon and Auntie Bev Muraoka — while singing and playing the ‘ukulele for his original compositions, Kaua?i I Ka M?lie and Nani Wai?ale?ale. 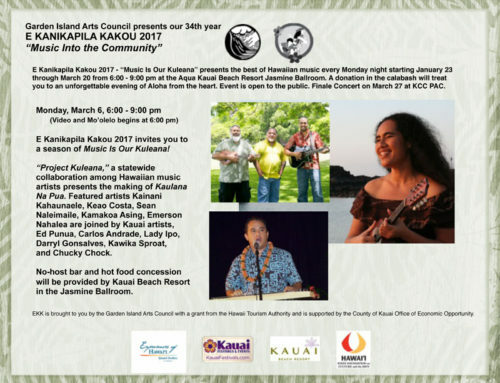 He shared the story behind the first song which he wrote back in 1992 when Hurricane Iniki totaled his home in Wailua. He took a vacation to East LA in November to get away from the devastation. While sitting in his friend’s kitchen, he witnessed a shooting on the street, a mother chasing one of her kids with a broom, and a gang fight between the Armenians and the Mexicans. He felt so homesick he wanted to leave that night to return to Kaua’i. Out of this experience came his composition Kaua?i I Ka M?lie. (Kaua’i in the Calm) Yes, we native Kauaians all know that feeling whenever we leave this beloved island. In 2012 my friends from Ecuador attended several of the Kaua’i Mokihana Festival events; the thing that blew them away the most were the white-haired hula dancers moving gracefully and sensuously to music. We see it all the time and take it for granted that kupuna dance the hula as long as they can, and if they can’t stand they can still do the noho hula, but it was mind-altering for the family from Ecuador to witness that. 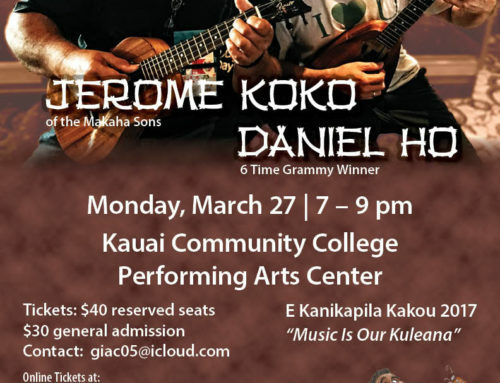 The second half of the evening began with a surprise and a bang as one name was drawn from the Kamoa ‘ukulele bottle; no one was more surprised than the lucky winner, David Helder from Wainiha who had been playing his five-string tiple as one of the members of the musical team. Adding to the surprise was the oli & kahiko by Kumu Hula Hinano and selected members of his halau, Ka P? Hula O Hinano. Hinano’s powerful oli was riveting as the dancers entered from the back, dressed in their kahiko costumes in warm oranges, gold, red, pink and yellow. Their dynamic choreography in the kahiko hula to Hole Waimea was exciting as they swished their yellow-green ti-leaf skirts and rattled their uli’uli with the bright red and yellow feathers. The audience screamed approval as the dancers duck-walked on bended knees across the stage. Three male dancers in the front and two ladies in the back with Hinano seated on the floor, beating the ipu heke and pahu drum and chanting the oli. Four more female dancers joined the group for the second number ‘O Kalalau. Because his halau is newly formed, Hinano sewed all their costumes especially for this performance. Can you believe that? Oh, it all went by too fast! 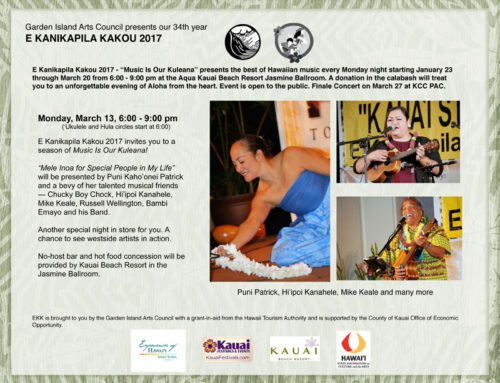 A musical interlude included Haunani Kaui and Auntie Bev Kauanui singing the Hanalei Medley – Hanohano Hanalei & Ka Ua Loku. On a somber note, Auntie Bev shared a song written by a Kalaupapa resident who had never seen a sunset with his own eyes but managed to compose the medley because he could feel the sunset. Her ladies danced to `Aina O Moloka`i/Sunset of Kalaupapa Medley. When Maka sang Hanalei Moon and Lady Ipo invited any and all hula dancers to join her on the stage, over seventy dancers stood up around the room and in the aisle and danced to this iconic Kaua’i hula number. Can you believe? I was privileged to see Natalie Ai Kamau’u and her husband I’o Kamau’u give an incredible and unforgettable concert at the Waimea Historic Theatre on Wednesday, February 22. They flew in from Japan, did the performance, and flew back to Japan the following day. Among her many touching stories about the songs she composed and sang, she pointed out that the song she remembers most as confirming her role as a singer rather than a hula dancer was when she first sang Hanalei Moon. When you hear her soaring voice bring that song to life, you knew she was really paying attention to herself; the rest is history as she repeatedly claims “Female Vocalist of the Year” awards at the Na Hoku Hanohano Awards. Another crowd pleaser was the audience participation hula led by Lady Ipo and Bev — ?Uwehe, Ami and Slide. It can’t be a crime to have that much fun as Maka stepped on the stage and led the dancers all around the room in this sassy finger-snapping, hand-waving, ‘ami-loaded, floor-gliding hula. If it were, we’d all be in jail, which is just across the highway from KBR! This hula epitomizes the whole evening because everyone was having too much fun! Even security! Continuing the audience participation, Lady Ipo invited the weekly lei givers to the stage to dance a group hula to Aloha Kaua?i. This is one of the favorite hula that is danced nearly every week and it’s never enough. Each dancer on the stage danced a different choreography of this hula but it was all good; so many interpretations of this hula. Kumu Hinano, dressed in aloha shirt and decked with leis, and eight of his dancers, ladies wearing long silky mauve hula dresses, black shell leis and giant orchids in their hair and gentlemen looking dapper in aloha shirts, performed an auana hula to the song Lei Nani. Needless to say, his auana dancing is as beautifully choreographed as his kahiko hula. If this is a taste of what Hinano will be sharing, we can look forward with much anticipation to future sharing by his halau. So exciting! Papalina Lahilahi, definitely one of the favorite audience participation hula worldwide, again enticed over 100 dancers to surround the entire room. Aunty Bev Muraoka’s unmistakable and powerful voice rang out with just that right flavor of sassiness, throwing in her rascal comments about the lyrics, definitely her signature style of singing. It was the community hula night to end all community hula nights! Top that, Malie Foundation! Each week the performing artist show awe on their faces when the audience stand up to sing Hawai’i Aloha because there are few places and gatherings in Hawai’i where nearly everyone knows the song. For the newbies words are provided so they can sing along. This week was no exception. Uncle Nathan, Aunties Bev K and Bev M led the huge crowd. Many local voices tinkled the icicles hanging from the light fixtures because the singing was loud, harmonized, and joyful. More than anything, it’s the emotional impact of the song that brings tears to the eyes of many who experience this for the first time. Many an EKK attendee has pointed out to me over the years the thing they remember most about EKK is the final song of the evening.